How can it still be winter? Maybe it was yesterday’s pounding rain or last weekend’s sneaker snow. Or maybe it’s because my daffodils refuse to show their happy yellow faces. Whatever the reason, I AM READY FOR SPRING! I want the sweet smell of daphne and narcissus. Warm breezes that send fruit blossoms falling like confetti. Evenings pleasant enough to eat on the porch. For the moment, however, I suppose I’ll have to settle for the pleasures of winter — cuddling with a good book near the wood stove, sipping big, red wine, and feasting on heartwarming bowls of steaming pasta. Lately, I’ve been aching to dust off my pasta maker and roll out sheets of fresh egg pasta to turn into lovely cheese ravioli. Perhaps with a roasted walnut sauce… or sauteed in butter and fresh sage. 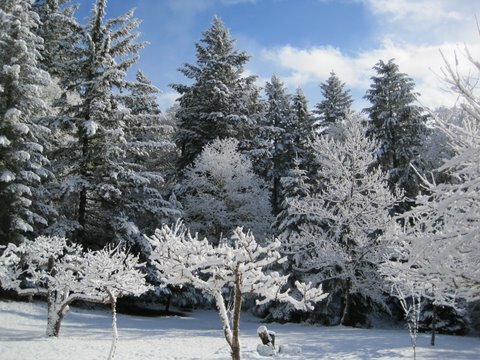 Unfortunately, late winter is also the season to complete time-sensitive tasks like inventory and taxes. So I’ve settled for simpler dishes, such as smoked salmon cream sauce and broccoli and penne — the recipe I’ll share today. It may not be homemade ravioli, but it still warms me on a cold day. I learned this recipe from my Italian mother-in-law. My husband often jokes that he has the only Italian mother who doesn’t like to cook. While there may be some truth to that, she does excel at some dishes, and this is one of them. 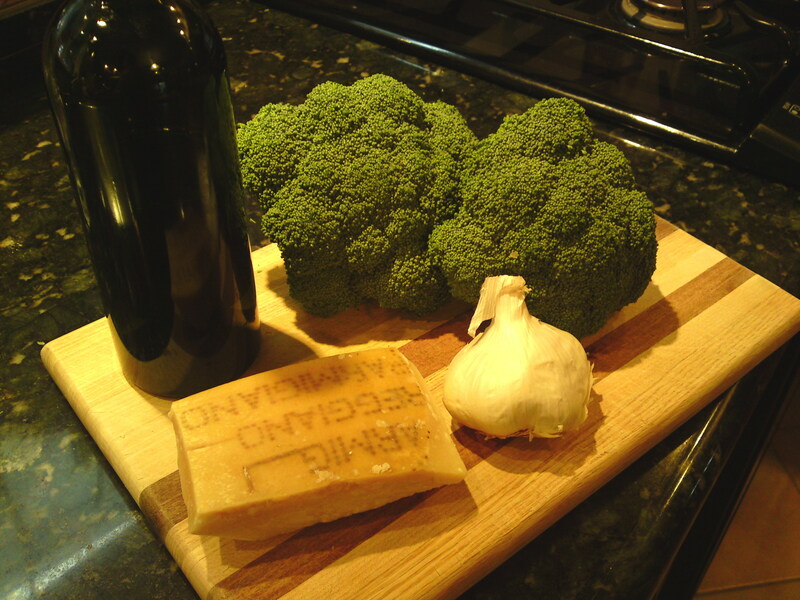 It goes against most modern methods of cooking vegetables in that the broccoli is boiled to near-disintegration. 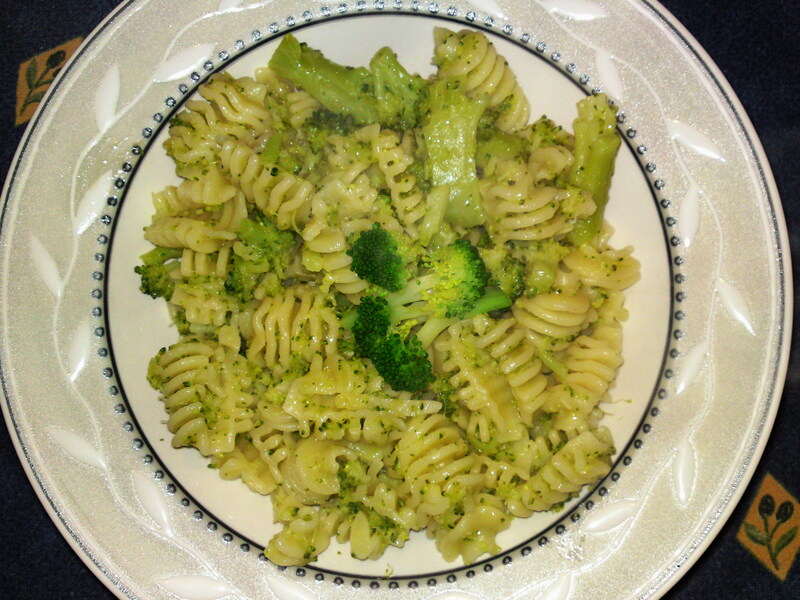 I have tried to make this dish without overcooking the broccoli, but it just does not create the same creamy sauce that makes this dish so yummy. Although the recipe is “Broccoli with Penne,” it can be made with many hearty pastas, such as rigatoni, fusili, and (as shown in my pictures) radiatori. And although I usually make this with regular old broccoli since it’s what is most readily available, don’t hesitate to use a stronger flavored variety such as broccoli raab — or, if you happen to be near the slopes of Mount Vesuvius, my all-time favorite friarelli. Start your pasta water first, and add a nice palm-full of rock salt. 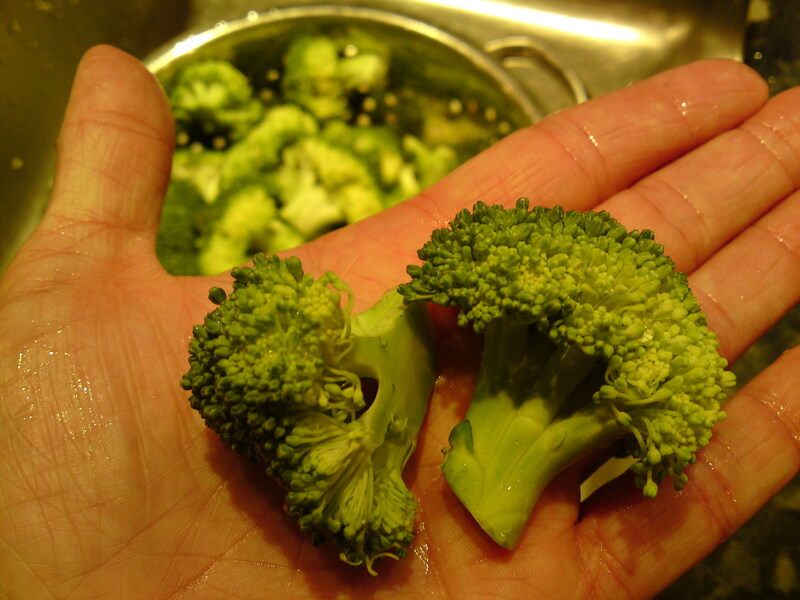 Wash the broccoli and cut into smallish florets — not too much stem as it won’t cook down as quickly as the rest. 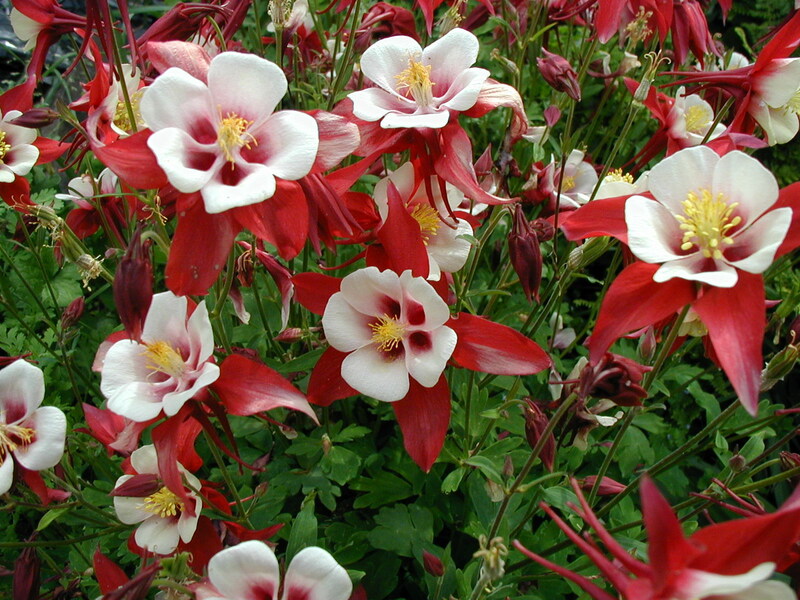 Split any larger stems. Aside, in a frying pan large enough to fit a pound of cooked pasta and the broccoli, saute the garlic, pepperoncini, and olive oil over low heat until the garlic turns golden. Keep a careful eye to make sure it doesn’t burn. Once the garlic reaches the perfect stage (for me, that’s deep blond and semi-caramelized), remove the pan from the heat. Here is a picture of the little pepperoncini we haul home from Italy a quart bag at a time (that’s just a regular-sized paring knife). 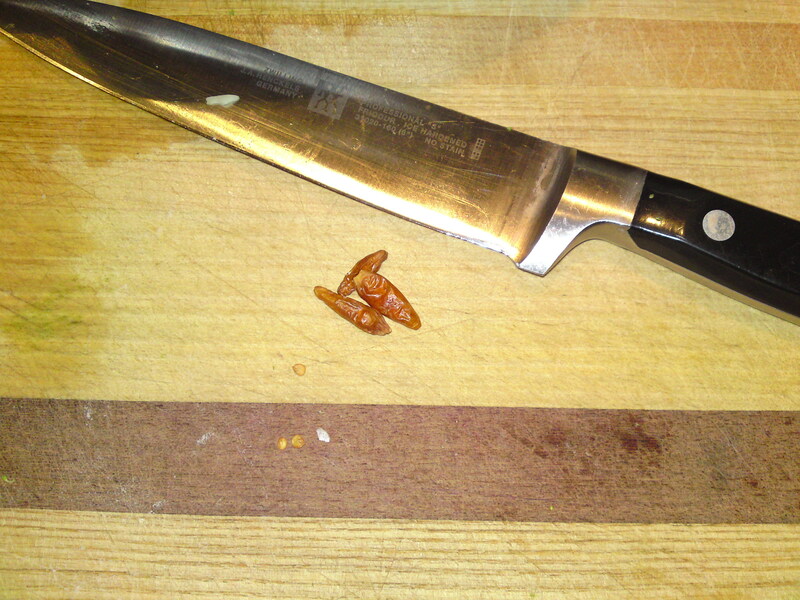 That quart of dried peppers lasts us for years and years. You’d think they would be horribly bland after all that time, but these little nuggets just seem to get hotter and hotter as the seasons pass. 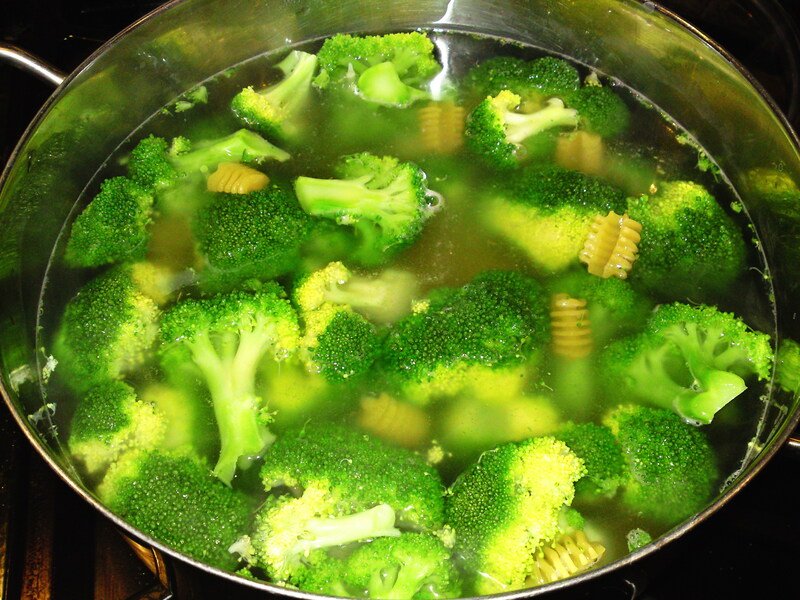 Once the pasta water boils, toss in the prepared broccoli and let it boil for 3 or 4 minutes. If you use a firmer broccoli, either cut the pieces smaller, splitting the stems, or cook it a little longer before adding the pasta. If you’d like a garnish on your finished plate, pull out a few bright green florets at this time and let cool. Then add the pasta to the boiling water and cook together until al dente. Don’t forget to keep an eye on your garlic and oil if it’s still cooking. By the time your pasta is nearly cooked, your broccoli should be close to falling apart in the water. If not, don’t hesitate to pull some florets out and manually break them apart. Note that you don’t want the broccoli so well cooked that the stems are bared of florets and they all go down the drain when you strain the pasta and broccoli. Once the pasta is cooked, strain well in a colander. Turn the flame under the oil on to medium, add the broccoli and pasta, and toss. The broccoli should easily break apart as it’s mixed. If the mixture looks too oily, add 1/4 cup or so of freshly grated Parmigiano — which will thicken the sauce. If it looks too dry, either drizzle with oil or add a tablespoon or two of butter (yum!). Serve piping hot with freshly grated Parmigiano.